If xylitol is so great, why haven't you already heard of it? We don't know why not but that exact problem is why we created this website. For whatever reason, here in the USA xylitol really isn't promoted all that extensively by dentists, the media or even manufacturers who make products that feature it. But in other parts of the world, and especially in Europe and Asia, its anti-cavity benefits have been well publicized for decades. As an example of its popularity elsewhere, in South Korea and Japan the best selling sugar-free chewing gum brands are sweetened with xylitol. Here are the things that you'll need to know. a) How effective is it? As mentioned above, the simple step of creating a daily exposure to the right amount of xylitol (not too much, not too little) can set the stage where you experience a reduction in your risk for tooth decay, possibly on the order of as much as 60%. Better yet, this protection will continue on for several months, possibly even years, after you've totally stopped consuming it. Research suggests that xylitol is able to defend a person against cavities via a couple of different mechanisms. Our pages explain how each of them works. But don't worry, the science involved is all just basic stuff. c) Is it safe? Are there side effects? 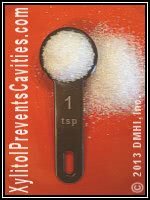 Since xylitol is a food item, it offers a very safe way to step up your level of anti-cavity protection with essentially no risk. Those few side effects that may occur (typically by consuming too much) are usually managed quite easily. d) How much xylitol intake do you need? Dosing levels are important. A certain minimum daily exposure must be created but consuming more does not produce a greater anti-cavity effect. And you might be surprised to learn that you don't even have to swallow xylitol to get it's full benefit. All that's needed is that some residual amount of it remains in your mouth for some period of time. Each day's exposure should be divided up so that it's consumed in small amounts throughout your day. And your regimen must be continued on for several months before you finally get to the point where optimal (maximum) protection is established. Look for chewing gum, chocolate, syrup and jams too. e) How to choose effective xylitol products. You could get your needed full daily exposure just by sprinkling granular xylitol on the foods and into the beverages you normally consume (it looks like, and you use it just like, regular table sugar). Or if you prefer, you could create your exposure by using specially formulated products such as chewing gum, mints, candies, chocolate, syrups, oral rinses or toothpaste. Of course, some xylitol products are better than others. Our pages (use the link above) show you the various ways you can use to identify the very best ones. Xylitol doesn't taste bad but it's not exactly like sugar either. I like it fine but my husband doesn't. It's not exactly the same but, really, I've gotten to the point where I prefer it. I just use it in tea and coffee. I just use a small amount (trying to spread out my dosing evenly over the day) and use artificial sweetener to finish things off. I can absolutely tell a difference when I don't use xylitol and have gotten to the point where that's my preference. I think the notion that Xylitol PREVENTS Cavities is total hype. I think this is hype. Xylitol is NOT anticariogenic. 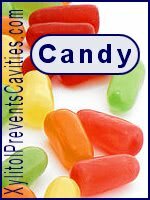 It is simply not fermentable and in gum it promotes increased salivation which can remineralize early cavities. It has no effect on diminishing cavity causing bacteria. We agree that the act of chewing gum provides anti-cavity effects on its own. In fact, we have an entire page dedicated to the subjectof why getting part or all of your xylitol dosing via chewing-gum makes such a good choice. As far as the effect of xylitol on cavity-causing bacteria, this study from 2006 found a reduction in mutans streptocci levels (a type of bacteria instrumental in causing tooth decay) in both dental plaque and saliva with increased levels of xylitol exposure. It also discusses how levels of other types of oral bacteria were not affected by the xylitol. This is a nice site. Thank you for the information.